Based on the soil ofChina's long-term patriarchal society,China's architecture has gained the greatest achievements in palatial and capital city plans, giving prominence to the supremacy of authoritarianism and strict obsession of hierarchy. The palace had its roots in the Xia Dynasty and reached its pinnacle in the Sui (581-618) and Tang (618-907) dynasties and became even more exquisite in the Qing Dynasty (1644-1911). The pattern of the complete capital city plan had been formed in the Western Zhou Dynasty. Chang'an (present Xi'an, Shaanxi Province), capital of the Sui and Tang dynasties, Dadu of Yuan Dynasty and Beijing of the Ming and Qing dynasties are the three capitals enjoying the highest reputation in Chinese history. Chang'an of the Sui and Tang dynasties was first established in the third year (583) under the reign of Emperor Sui Wendi. The outermost circle of the city wall was called Guo Cheng, stretching 9,721 meters from east to west, 8651.7 meters from north to south, and covering 84 square km, making it the largest city in ancientChina. The Gong Cheng (palatial city was in the middle of the northern part of Guo Cheng. In the middle of the interior wasTaijiPalace, a large hall for an audience with the emperor. To the east was theDongGongPalace, where the crown prince lived, while on the west wasYetingPalaceused by the queen. 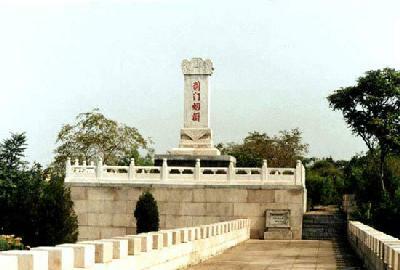 Huang Cheng (imperial city), in the south of Gong Cheng was where state-level government organizations mainly settled. In the southeast and southwest corners were the Tai Miao and the Sheji Altar for worshipping the god of land and grain. The total area of Huang Cheng and Gong Cheng was about 9.41 square km. The streets of Chang'an were neatly arranged and symmetrical, with a strict positioning relationship. The main street, running from Mingdemen in the middle of the south of Guo Cheng straight to the north through the whole city, is the longest axial line in the history of world cities. The whole city had 11 north-south streets and 14 east-to-west. In this well-arranged matrix there were 108 residential quarters, and there are east and west markets. In the beginning of the 13th century, the Mongolian army led by Genghis Khan drove straight on to Zhongdu (present-day Beijing), the then capital of the Jin Dynasty (1115-1234), and burned the imperial palaces in it, reducing the city to ruins. Later, the newly established Yuan Dynasty (1271-1368) rebuilt the city and made it the capital, with its name changed to Dadu (present-dayBeijing), meaning grand capital. In Dadu city, 50 residential areas were constructed, calledfang, meaning a portion of land, with straight streets and lanes of various width between them. According to Xi Jin Zhi in the Yongle Canon compiled in the Ming Dynasty, an avenue was 24bu(approximately 36 meters) wide, a street was 12bu(about 18 meters) wide, and an alley 6bu(about 9 meters). There were over 400 alleys in the city. With the downfall of the Yuan Dynasty and the establishment of the Ming Dynasty, Dadu was rebuilt on the basis of its original structure. The imperial court of the Ming Dynasty soon moved fromNanjingto Dadu and renamed the cityBeijing. Beijingwas transformed on the basis of the metropolis of the Yuan Dynasty. The city was built in the 14th year (1420) of the reign of Ming Dynasty Emperor Cheng Zu, and in a slightly horizontal square shape. It stretched 6,650 meters from east to west, and 5,350 meters from north to south, with brick city walls on all sides. It consisted of nine city gates, outside each of which there was a Weng Cheng (earthen-jar city). Acted as the city gate was a two-layered three-eaved tall building. On the Weng Cheng was a four-layered embrasure watchtower, with walls laid with bricks, looking very magnificent and solid. The Forbidden City, located in the center of the axial line, stretches 760 meters from east to west and 960 meters from north to south, with its size accounting for only a little over one-sixth of Taijigong City in Chang'an of the Tang Dynasty. The palace itself was formed by linking in order the numerous "doors" and the many squares called "Chao" along the axis. There were approximately "five doors and threechaos". Outside the doors andChaos, there were "Qins" (bedrooms). The sequence ofChaoandQinwas "Chaoin the front andQinat the back". The streets ofForbidden Citywere neatly and symmetrically arranged with a strict positioning relationship just like the Tang Chang'an, but more densely populated.